Finding the right foundation is something everyone spends a huge part of their adult life doing. It is, after all, the face we wear to the outside world, and for some of us it is the one that stays on longer than even our real complexion. 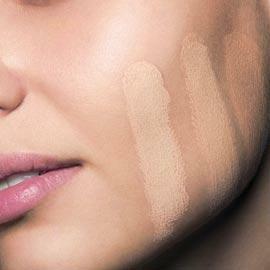 Choosing a foundation is really about trial and error. The ones I look at and are used to, the ones I recommend and like, or the ones your best friend swears by, is nothing more than something new for you to try. Because at the end of the day, we all have different needs, lead different lives and face different environments. That makes our foundation requirement as unique as can be. To get you started, however, here are the top three foundation products on Amazon that I've distilled a boat load down to. These are not all natural and while I usually use natural products, I have kept in mind that not everyone is on the natural wagon and so I kept my choices broad. Now these come with a few options to choose from. I narrowed the list down to one that has a built in sun protection. This one is user-tested and it did very well. Apparently more than 90% of the users who use it frequently experienced a reduction in pores on their face and almost 90% saw clarity in their face complexion and reduced the shiny, oily feature that we all run from. The major improvement in this over the previous version is that there is no shine. The matte finish reduces the shine significantly and gives an airbrushed look. There is one other aspect that will go over well for those of you who pay attention to ingredients. Well, you will find that this one is missing Bismuth Oxychloride, and that is just fine by me. One way to tell if a product is a contender is to see the number of people who took the time to comment and vote on a product, and then there is the quality of the comment. This is one of the reasons I keep going back to Amazon. The comments give me a heads-up about the product. In this case, more than 70% of those who voted gave it a full five stars. If I read nothing else after that, that would be enough to know that it is overwhelmingly a good solution. However, not only that, it averaged more than 4 stars and the comments that gave it less than 3 stars were not about the product but about errors in delivery and issues with mixups. So as far as the product goes, its still worth it in my books. One of the frequent comments that graced the comments section was that this foundation looked natural. The other products, no matter how cool, dod not have the natural look and this one took the prize in that department. If you want to have toe simple look, just put this on before heading out, and you will have a really natural, clean look. It wears well with the top down in the convertible and looks just as good when you're at the country club. It is especially great to wear outdoors, and so wearing it to work in the summer is ideal. Some of those who bought it couldn't sing enough praises for it. What gets them so pleased was the fact that it made their skin look "flawless" and that it's "long-wearing." I like the one where one user said that it was "kind on my skin." That basically says it all. What's the point of getting a product that looks great but its slowly destroying your skin underneath. Tis doesn't do that, and I appreciate that. As far as the price goes, its just a shade over thirty bucks on Amazon, but a lot higher at some other retailers. It is a 0.35 ounce bottle that comes in either Fawn, Golden Glow, Latte, Radiant, Riviera, Warm Sienna and Warm Silk. I like the fact that it is water resistant and paraben-free. Its great to use as a concealer or a foundation, or as a sunscreen, or just when you need them all at once. This foundation stands at the top spot among my picks because of its gel-like texture that makes application a joy. It also contains jojoba oil along with Vitamins A, C and E and it is free from parabens. Regardless of being natural or otherwise it is important that there are no parabens in the ingredients as much as possible. This one is also free of silicone so there is no clogging of the pores and long term damage to your kidneys that have to filter it from your blood after it absorbs though the pores. Across the web, comments were pretty consistent. More than 60% of users gave it a full five stars and it averaged 4.3 stars. I would give it higher because the ones who didn't like it and rated it 1 star was upset more about the fact that delivery was a problem. So it doesn't really speak to the effectiveness of the product. so really, that moves the average up a notch. Then there were the two 3-star reviews. When I looked at them, not one whisper about the product being bad, just that it didn't make skin fairer. Well that's not what it's supposed to do. So it's not fair to penalize the product for not doing something its not designed to do, so I would have to toss the two three star reviews and what that leaves me with is the four and five star reviews and that takes the average up to an average of 4.7 stars, which I think it deserves. At $32, the last time I checked, for a 1.7-ounce tube, the price is worth every penny. I noticed too that no one seem to get that this tube makes it the perfect travel companion for touch ups, then I realized that there was not much need fro it because the primer wore well and lasted long. In my books thats worth the effort. I've seen this in malls and they are a lot more expensive, so I'd just stick to getting it at Amazon for now.